We’ve all visited those lovely little resort towns that sit on lakes or rivers and make wonderful escapes when we’ve had too much of urban life. In my Writer’s Apprentice novels, Blue Lake is just such a town, and like any real vacation escape, its streets are lined with storefronts. Every one of these doors leads to new stories, fascinating lore, interesting people. One of the first places Lena London discovered when she came to town in Book One (A Dark and Stormy Murder) was a hardware store called Bick’s. In the slightly musty lobby of this eccentric and whimsical place stands a giant Grizzly bear who holds a sign that says “Bick’s is Best.” For a year, Lena walks in and out of Bick’s to pursue various purchases or to mail letters in the ancient post office at the back of the store, but only in Book Four (Death Waits in the Dark), does Lena learn the story of the Grizzly. His name was Wally. Wally, in life, had been a fixture at the Riverton Zoo, a couple hours from Blue Lake. Beloved by all of Riverton and by zoo visitors from far and wide, Wally enjoyed a long life and formed a loving bond with his caretaker. When the bear died of old age, his keeper asked to have Wally preserved in the hopes of keeping some part of his majestic bear alive for posterity. The man received permission and Wally became a work of taxidermy, similar to the fellow pictured here (from Wikimedia Commons). Through a series of events that are made clear in the book, Wally makes his way to Mr. Bick, and for years he has stood guard in the lobby of Bick’s Hardware. Lena learns this information and feels neglectful—she has passed Wally so many times, but she had never learned his story. With each door she enters in Blue Lake, Lena learns more about the people—and the animals—who populate her town. In the latest installment, she also learns a great deal about the past. Her employer, the suspense novelist Camilla Graham, is confronted by a woman who threatens to reveal “Graham family secrets” if Camilla does not come clean. Unfortunately, Camilla has no idea what the woman means, and everyone in the Graham family is dead. She and Lena must come together to find out secrets from the past before someone sullies the family name of Camilla’s dear deceased husband, James. 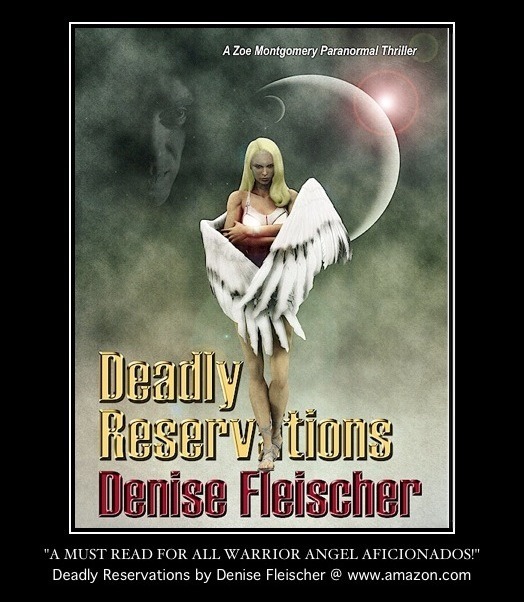 As they search, they find dark secrets—and death. Death Waits in the Dark can be pre-ordered now! There’s never been a time in my life when I didn’t have a cat companion, and the cats of my past have certainly inspired the references to cats in my fiction. In my childhood, there was Midnight, the defiant and mysterious black feline who ruled our suburban street and enjoyed sunbathing in the middle of the thoroughfare, much to the chagrin of motorists. Midnight knew the limits of the dog’s leash, and he would wash a casual paw just a few inches beyond the dog’s reach because that’s what cats do. On one occasion the dog, Buffy, managed to pull the tether out of the ground, and she ran at Midnight, her tormenter. Midnight shot straight up into the air, and Buffy ran under him, and then stood, confused, not sure where the cat had gone. Despite his toughness in the neighborhood, Midnight was a cozy cuddler, and we all competed for his love. When he entered the room in the evening, it was suddenly a contest. Whose lap would he choose? When we were chosen, we felt truly superior to the others, because it was a significant thing to be selected by Midnight. Later, there was Max, a beautiful gray and white kitten. Because our family couldn’t decide on a name for him, we combined all his names in one: Baron Maximilian Frederick Sebastian Von Tinkel Klaus III—but we just called him Max. Max was an amazing, beautiful, curious kitten. He was so friendly anyone could pick him up, and sometimes he sat on my shoulder like a bird. He was my mother’s favorite. Back then (the 1970s) everyone let their cats outside, and if I could go back in time I would make him an indoor cat because he died young (seven months) after getting hit by a car. Forty some years later I still remember what a great cat he was. After Max, my mother wanted no other cats, but a few years later, giving in to my longing for a feline companion, my parents got me a cat for Christmas, and we named her Holly Mistletoe. She was a sweet little orange cat who grew into a sort of cantankerous adult, but she had an amazing creative talent that I’ve never seen in another cat. When we would go out, we’d give her a ball of yarn to play with. When we came back, we would arrive to find a splendid, multi-level yarn labyrinth that often covered an entire room. She would hold the ball in her mouth, jump up somewhere, loop her yarn around, then jump down. She’d do this over and over; it was almost like weaving, and the results were magical. I wish we had taken pictures, but instant cameras weren’t a thing then and we never bothered to capture her creations for posterity. When I got married and moved into my first apartment, I knew that I wanted cats of my own. I convinced my husband, who had never had pets, to go with me to the shelter and select a couple of kittens who could keep each other company. We came home with two lovely gray tabbies that we named Cato and Clouseau because they kept attacking each other the way Inspector Clouseau and his friend Kato attacked on another in the Peter Sellers Pink Panther movies. These two were a delight from the moment we got them, full of mischief and very loving to one another. This was back in the eighties (which partially explains my hair), so of course these sweet boys are no longer with us, but we think of them all the time! Our final cat of the past entered our lives very unexpectedly. We lived in a very small apartment with the two guys mentioned above, and one day when I went into the hallway, bound for work, I found a kitten walking around and meowing. I petted her but left her alone, thinking she must have snuck out of someone’s apartment and not been discovered missing yet (how else would she have gotten on the third floor of a locked apartment building? When I got home that afternoon, the poor little cat was still in the hall, mewing and obviously hungry. This infuriated me, so I took her into my apartment. She marched straight to the bowls of my male cats and started eating. She was a very pretty calico, and obviously just a few months old. I called my husband and explained that, at least for the time being, we had a third cat. I put up signs all over the building, telling people to come and claim their kitten, and no one ever did. My husband’s theory is that some little boys in our building found the cat somewhere, brought it home, and then put it out when their parents said no cats. But we’re just not sure how she ended up in our hall. I was angry at the way she’d been mistreated, so I didn’t feel bad at all for keeping her safe in our apartment. When we brought her to the vet, we found she had ear mites and worms, another sign for me that she had not been cared for and had probably been brought in off the street. So she became our Kahlua, a lovely calico cat and a true friend to the two tabbies we already had. (That’s all three of them with my husband in the slightly blurry photo below). So—those were the cats of my past. Stay tuned for my next post on Gotta Write Network with an update about cozy cats of the present! Thanks for reading my animal stories. Julia Buckley is a Chicago author and teacher. A lover of mysteries herself, she spent her teen years absorbing the wonderful mystery and suspense fiction of the 20th Century, all of which helped to influence what she writes today. Her published series include the Writer’s Apprentice mysteries, the Undercover Dish mysteries, the first in the Teddy Thurber series, and the Madeline Mann mysteries. She is a member of the Mystery Writers of America, Sisters in Crime and the Chicago Writer’s Association. With the advent of my third UnderCover Dish mystery, PUDDING UP WITH MURDER, I thought it would be appropriate to talk about pudding, that comfort food thousands of years in the making. According to Food Timeline, custard-like foods date back to the Middle Ages, but foods that were called “puddings” were initially sausage-like, contained within a skin. Eventually, sometime between the 17th and 19th centuries, pudding evolved until it was more like cake (as in the English puddings that we sing about in Christmas carols). Somewhere in the 19th Century pudding was boiled, sometimes with chocolate added, and it came to have a new consistency and a new group of fans. The original title of my book was THE RICE PUDDING PROBLEM because Lilah Drake, undercover chef, bakes a giant pan of rice pudding casserole for some children at a party. Rice pudding, like many puddings, is a comfort food, thick with rice and custard and sweetened with sugar and cinnamon. My own mother used to make rice pudding in a pot, with the “old fashioned” recipe of boiling the rice, then adding milk, sugar and salt until thick and creamy. It’s a simple recipe, but always seems to reach something in the soul, as do many foods that bring us gastronomical pleasure even while they connect us to some emotion—love, or nostalgia, or togetherness. Thanks to my mother, I am a fan of many puddings; I love a nice bowl of chocolate pudding, or vanilla, or butterscotch (delicious! ), but I also like the textual complexity of tapioca pudding, bread pudding, and rice pudding. She made them all when we were children, poured them from the pot into parfait cups, then stored them in the fridge so that they would gel and be the “fancy” dessert we ate after dinner. I used to open the fridge more than once to look at those gleaming vessels and anticipate the delicious dessert to come. In PUDDING UP WITH MURDER, Lilah understands the connection between food and emotion; she is an alchemist in this sense, bringing more than flavor out of food, but finding ways to turn it into something deeper, richer, for her customers. What’s your favorite pudding? And what emotion does it evoke in you? Readers who enjoyed my first Writer’s Apprentice mystery, A DARK AND STORMY MURDER, don’t have to wait any longer for the sequel. DEATH IN DARK BLUE was available in early May. Since I don’t want to delve too deeply into the storyline and risk spoilers, I thought I’d talk a little more about Blue Lake, the fictional town where all the mystery happens. Blue Lake is an amalgam of any number of Midwestern small towns I’ve visited, and even Bick’s Hardware has shades of other hardware stores I’ve seen over fifty years. One in particular stands out. It was a wonderful old store in Valparaiso, Indiana—my college town!—and I happened to wander into this place when I was twenty and searching, just before Christmas break, for family Christmas gifts. I had chosen my brother Christopher’s name in the family grab bag, and I wanted to buy him a saw and a flannel shirt (both on his list). So I walked the mile from campus to Valpo’s downtown strip, and I stumbled across an amazing place called Wark’s Hardware. The interior was dim, dusty, wonderfully fragrant of cut wood and mixed paint and varnish. Like Bick’s Hardware, Wark’s had shelves that went all the way to the ceiling, and in fact it had a dizzying effect, giving me a sense of vertigo until I adapted to the sheer volume of stuff on the walls. It didn’t take me long to realize I loved the place, especially after asking Mr. Wark for some help and finding that although he hadn’t smiled much, he was quite friendly and attentive, and spoke in a scratchy voice that grew on me, too. I bought a saw from him, and when my family came to pick me up a day later, I insisted that they visit Wark’s Hardware with me just to revel in its wonderful eccentricity. In addition to my love of hardware stores, I am mad for antique shops. My husband and sons do not share this love, and so I am often a lonely wanderer on family vacations, trying to suss out likely-looking places that might hold dusty treasures when all the boys are ever looking for is a good hamburger joint and perhaps a place that sells guitars. Some of my cool antique shop finds have also made it into Bick’s Hardware, but I’m thinking that in a future book I might just let Lena wander into an antique shop and get lost in the wonderful objects that take her to other times and places. Julia Buckley is the author of the Undercover Dish Mysteries, the Teddy Thurber Mysteries, and the Madeline Mann Mysteries. She’s a member of the Mystery Writers of America, Sisters in Crime, and the Romance Writers of America, as well as the Chicago Writers Association. Julia has taught high school English for twenty-six years; she lives near Chicago with her husband, two sons, four cats, and one beagle. You can visit the author at juliabuckley.com, http://www.juliabuckley.blogspot.com, twitter.com/juliabucks, and facebook.com/JuliaBuckleyMysteryNovels. Restaurant owner and aspiring novelist Olivia Limoges is happily enjoying her new marriage. Sadly, the same doesn’t hold true for Laurel, a fellow Bayside Book Writer. While struggling with a demanding job, twin boys, and a terminally ill mother-in-law, Laurel learns that her perfect marriage is mostly fictional. When she catches her husband fooling around with his mother’s hospice nurse, she issues impassioned threats that will later come back to haunt her. Ellery Adams is the New York Times bestselling author of the Books by the Bay mysteries, the Charmed Pie Shoppe mysteries, and the Book Retreat mysteries. She grew up on a beach near the Long Island Sound. Having spent her adult life in a series of landlocked towns, she cherishes her memories of open water, violent storms, and the smell of the sea. Adams has held many jobs, including caterer, retail clerk, car salesperson, teacher, tutor, and tech writer, all the while penning poems, children’s books, and novels. Christmas in September—Who Feels Merry? While Christmas is still four months away for us in the real world, it’s come a little early in fictional Pine Haven, Illinois, and Lilah Drake, still recovering from a brush with murder and a fling with a handsome police detective, has started a new life, giving up her day job as a Real Estate office clerk and taking on a job she likes much better, working at Haven of Pine Haven, the premiere caterer in town. She’s ready for the holidays, and has even taken Christmas cards with an image of Mick, her beloved chocolate Lab, in a Santa hat. Not Mick, but close: our puppy Digby. She’s also still making secret food for her clients who pay to say they made it themselves. All in all, Lilah’s career trajectory is on the upswing, but she’s feeling sad as she drives to a local grade school to deliver pans of macaroni and cheese for a class Christmas party. When she sees a man dressed as Santa for the school event, she decides to ask him for some advice. Not long afterward Lilah is getting back in her car and hears a strange sound; she looks across the parking lot to see that the poor Santa is lying in the snow, the victim of a single gunshot. So, with Christmas only days away, Lilah must face the fact that someone out there might be worrying that she witnessed more than she did. She also has to face her one-time fling, Jay Parker of the Pine Haven P.D., and tell him that—for the second time—she has managed to be present at a murder. Lilah’s problems are partially offset by her supportive family, who wrap her in their warm, protective embrace, and by the beauty of Pine Haven at Christmastime. She has always loved the garlands and the lights, the chilly air, the smiling people who choose to take a brief vacation from the stresses of life. In CHEDDAR OFF DEAD, readers will find out whether Lilah gets another chance with her one-time love interest, and whether an unknown murderer will decide that Lilah knows too much. Get it in bookstores and on Amazon! CHEDDAR OFF DEAD: An Undercover Dish Mystery, by Julia Buckley, Berkley, September 6, 2016, $7.99. Julia Buckley is the author of the Undercover Dish Mysteries, the Teddy Thurber Mysteries, and the Madeline Mann Mysteries. She’s a member of the Mystery Writers of America, Sisters in Crime, and the Romance Writers of America, as well as the Chicago Writers Association. Julia has taught high school English for twenty-six years; she lives near Chicago with her husband, two sons, four cats, and one dog. You can visit the author at juliabuckley.com, http://www.juliabuckley.blogspot.com, twitter.com/juliabucks, and facebook.com/JuliaBuckleyMysteryNovels. An aspiring suspense novelist lands in the middle of a real crime, in the first in a captivating new series by the author of the Undercover Dish Mysteries. 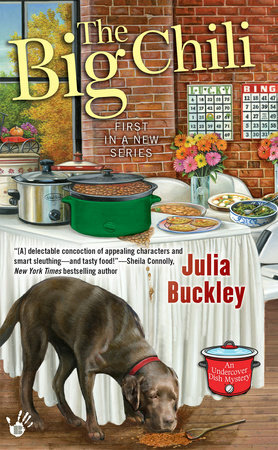 THE BIG CHILI: An Undercover Dish Mystery by Julia Buckley, $7.99, First in a New Series, Berkley, paperback. Or how the dog I made up for my cozy mystery ended up inspiring me to get a dog of my own. The Big Chili, my cozy mystery which debuts in early October, was a book that I hadn’t planned to write. That happens a lot with books—they start out as one idea in your head, and then they morph into something entirely different. The same is true of characters: sometimes the ones you think you’ll like end up fading away, and the ones you barely think about end up taking over your imagination. For me, this was true especially of Mick, my main character’s dog. Mick is a chocolate Labrador; I’m not sure why I initially chose that breed for his sweet character, but as the books progressed (I’m now halfway through book three), I found myself growing more and more fond of Mick, and even getting a little jealous of Lilah because she has this sweet companion in her life. I had my own canine friend, a beagle named Simon, but he was quite elderly and could no longer do the things that Mick could do—take long walks on crisp fall nights, run and romp in the yard, sit shotgun during long autumn rides in the car. Simon was, by his old age, a stay-at-home-and-sleep sort of doggie, and that was fine. Sadly, his health declined in the summer and in August we had to put him down. We started studying the website of an animal rescue site in Chicago. We found a litter of puppies who had recently been born on a Kentucky farm and had been surrendered to the rescue facility. They were “Lab mixes,” meaning Lab and who knows? We fell in love with a little puppy face on the site and made an appointment to see him at the facility. He was named Emory, and we adopted him on sight, but we soon changed his name to Digby, or Sir Digby, if we’re being formal. Digby, like Mick, will soon be able to accompany us on long jaunts around town. He is very inquisitive and playful, and he LOVES to bite things with his little puppy teeth, especially—despite about forty dollars’ worth of puppy toys in his bed—our hands and toes. He has puppy breath and a puppy bark and true puppy affection, and we have fallen in love with him more each day. Right now he’s sort of in quarantine, waiting for his puppy shots so that he can take walks and encounter other dogs. He’s investigating our house and finding interesting hiding places to take his naps in, and those naps are very long, since he is still essentially like a human baby. If it hadn’t been for Mick, the dog of my imagination, we would never have found Digby, who will now spend the next ten to fifteen years with us. And someday, if we decide to get him a companion, it’s going to be a chocolate Lab!